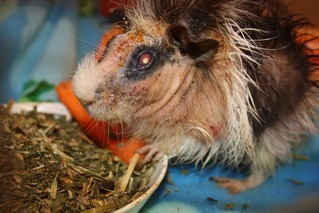 Survivor was a private surrender to Cavy Angel’s Guinea Pig Rescue, Late January survivor’s owner brought him to my work place seeking help for her sick guinea pig, I was shocked with the state of this poor boy, Survivor had severe mange and fungal infestation as well as a badly infected eye. After some time discussing what was best for Survivor we both agreed that in Survivor’s best interest that she’d surrender him to Cavy Angel’s Guinea Pig Rescue. 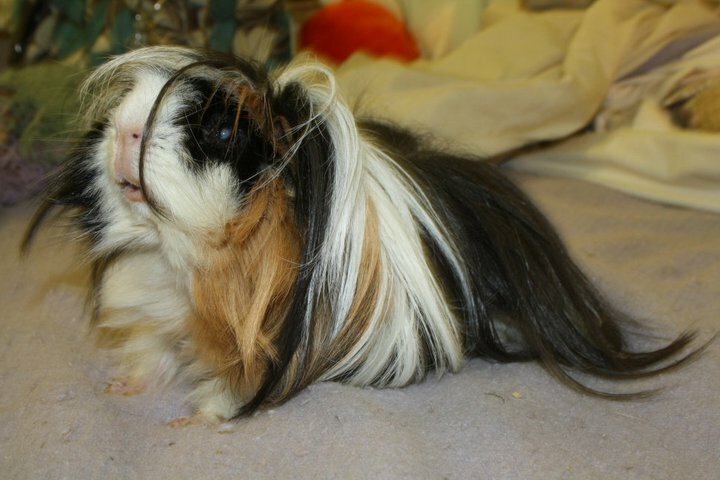 It has been a long road for Survivor but with many vet visits, Ivomic for his mites, daily betadine soaks, antibiotics for his eye, a good quality diet and just over 6 months of critical care he is now 100% healthy and is now a permanent member of Cavy Angel’s Guinea Pig Rescue clan.